Frequently Asked Questions How do I fix being stuck at “Checking outputs…”? 고객지원 > XSplit 브로드캐스터 > Frequently Asked Questions > How do I fix being stuck at “Checking outputs…”? 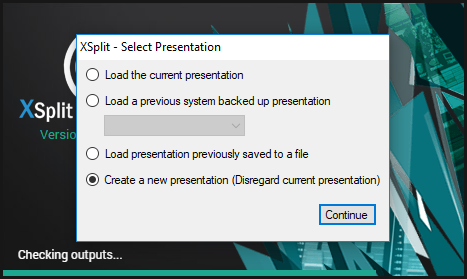 Hold down the Shift key while logging on to XSplit Broadcaster and when prompted, select "Create a new presentation". Rename your 'db' folder to something else then restart XSplit Broadcaster. We recommend renaming the ‘db’ folder to something easy to remember like ‘db.bak’. Note that the ProgramData folder is hidden by default and you may need to enable show hidden files in your Windows Folder Options. If the above steps still do not fix this issue, contact Technical Support.